Darjeeling: The youth wing of the Gorkha Janmukti Morcha has asked the Centre and the Bengal government to take an initiative to hold tripartite talks to find a "permanent" solution to the Darjeeling issue and said there should be "no interference" in the affairs of the hills. 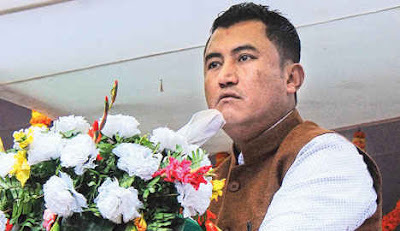 "We call upon the Centre and the state to initiate a process to start tripartite talks to find a permanent solution or else, the 100-year-old sore will never heal," Amrit Yonzone, the president of the Gorkha Janmukti Yuva Morcha, told a public meeting at Darjeeling Motor Stand here on Sunday. The demand for a separate administrative body for the Darjeeling hills was first raised by the Hillmen Association in 1907 and the statehood cry was also raised later in the same year. During the last year's Gorkhaland agitation, sources said, the Centre wanted to hold a tripartite meeting involving Bimal Gurung, who was the Morcha president then, but the state insisted that the party be represented by Binay Tamang. With the BJP backing Gurung, it is unlikely that tripartite talks involving the central and state governments and the Morcha will be held soon. "However, if the Centre agrees to sit for a three-way talk with Tamang, things would be extremely difficult for Gurung," felt an observer. The Yuva Morcha listed a series of other demands also on Sunday. #"For peace to prevail in the hills, youths need employment, vacancies in Groups B, C and D must be filled up immediately and infrastructure in education and health must be created immediately," said Yonzone. He went on: "For peace to prevail in the hills, there must be no interference. There should be no interference in language and other issues either. Cases registered against youths must be withdrawn and those in jails must be released unconditionally." It was obvious that Yonzone was referring to the Bengal government when he said there should be "no interference" as the purported move to impose Bengali in hill schools had triggered the last phase of the statehood agitation. The youth leader also said Binay Tamang had asked him to convey to the gathering that the Kalimpong district court would be inaugurated on March 16 and jobs of many temporary teachers in the GTA were being regularised. Yonzone said Gorkhaland was a dream, emotion and a demand but added that day-to-day realities were also important. Speaker after speaker lambasted Gurung for his visionless agitation last year, Darjeeling's BJP MP S.S. Ahluwalia for his inaction and the GNLF. "Our Gorkhaland dream was shattered the day a bomb was blasted here (Darjeeling Motor Stand). We had asked him (Gurung) to lead the agitation with a vision but he heeded the advice of some other people," said Yonzone. The first of a series of bombs to hit the hills last year had exploded at Darjeeling Motor Stand in August last year during the statehood movement. "Binay Tamang and Anit Thapa had to work to save our people, party and flag then," said Yonzone. The youth wing of the Gorkha Janmukti Morcha has asked the Centre and the Bengal government to take an initiative to hold tripartite talks to find a "permanent" solution to the Darjeeling issue and said there should be "no interference" in the affairs of the hills.